A Wicked Problem. A Wicked Solution? When Kevin Rudd announced Labor’s new asylum seeker policy yesterday, my knee-jerk reaction was to be very concerned. Kevin Rudd and his Labor colleagues obviously desperately want to win the election, as I hope they do. But the last thing I want to see is Rudd winning by adopting Abbott’s right wing policies– that’s not the Labor Party way. And besides, what’s the point of campaigning against Abbott for the last three years, only to eventually give in and say ‘if you can’t beat them, you may as well become them’? However, knee-jerk reactions aside, after having some more time to think about this situation, I must admit I’m really not sure what to think. But what I would like is to at least be given the opportunity to discuss and debate policy changes, before having them written off by every left-winger I know, before joining protests and before wasting my vote by not voting for anyone. When I first heard mention on Twitter that Rudd was going to get rid of the Carbon Price, I panicked. But then after realising he wasn’t actually emulating Abbott, and rather moving to an ETS a year sooner than we would have anyway, I understood it was actually a smart move. Taking ‘Axe the Tax’ away from Abbott has left him impotent. It has erased his one-dimensional stunt and smear campaign, and forced the media to take a least a cursory interest in his Direct Action alternative. This has to be a good thing. In an ideal world, the Carbon Price would have been accepted by the entire community as a cost we had to bear and polluters wouldn’t have pooled their resources to smash the Labor Party for bringing in this policy. However, we don’t live in an ideal world, far from it. And if the electorate is threatening to vote Labor out for introducing the Carbon Price, and all it takes to stop this happening is to change it to an ETS a year earlier than originally planned, isn’t this outcome better than handing power to Abbott and his wasteful, ineffective joke of a Direct Action policy? Might the ETS not even work better to reduce emissions? Pragmatism, I think it’s called. There’s no point being holier-than-thou in opposition when you can have the less-than-perfect, but better than the alternative, policy in government. Bearing in mind that the whole idea of Kevin Rudd as Prime Minister has been a little difficult for me to stomach over the last few weeks, I am now looking at his asylum seeker policy change and wondering if he’s done something evil and unacceptable, or if he’s again being pragmatic in the very less than ideal world of an electorate who hate ‘boat people’. When you’ve got every news outlet in the country, including the ABC, reporting every single asylum seeker boat arrival like it’s an invasion by an alien species, it’s no wonder there are large portions of the Australian public who feel justified in their bigoted hatred of people arriving by boat. But the really difficult problem, which many seem desperate not to discuss, is that the political reality of the situation is thus: if the majority of the electorate is going to vote for the leader who promises to ‘stop the boats’, Abbott is going to win the election by promising to ‘stop the boats’. And however vile, illogical and racist this sentiment is, I haven’t seen anyone, Labor and Greens included, make any headway whatsoever in changing this attitude in the Australian community. Yes, we should be talking about these people’s individual stories and their terror and desperation in their decision to get on a boat. But while we fail to hear these stories, and while the electorate refuses to budge on this issue, the Labor party is left with a wicked problem. Pander to the voters by promising to also ‘stop the boats’. Or lose the election by leaving the policy as is. And let Abbott ‘stop the boats’ by turning them around, which everyone with any expertise knows is not a viable alternative and will not solve anything. Also, good luck getting Abbott to increase the intake of refugees. He’d slash it given the chance. No doubt even suggesting that Labor should ‘pander’ to the electorate is enough for me to lose very Greens Twitter follower I have, but I’m not apologising for supporting anything that keeps Abbott out of power. So back to Labor’s asylum seeker PNG policy. Again, I haven’t totally decided how I feel about it, and I am not ready to jump to campaign against it, or to support it in full. But I do know that this is one policy area where many people seem to want it both ways. For instance, when the media reports the devastating news that asylum seekers have drowned on their journey to Australia, the government is blamed for these deaths. Because they didn’t ‘stop the boats’. But then when the government attempts to find a way to convince asylum seekers to stay where they are, to wait for resettlement, to not get on a boat, the very same people who are complaining about the dangers of coming by boat, are complaining about the policy alternative being cruel and inhumane. Let’s get something straight. Kevin Rudd can’t stop people who come by boat from drowning. If people choose to come by boat, a certain percentage of them will drown. This is tragic and unfair. But it is fact. This is why I am not afraid to say that I support stopping the boats. I don’t want to stop asylum seekers. I just want them not to get on a boat. In fact, if Rudd’s policy of sending asylum seekers to PNG does stop people coming to Australia by boat, won’t this policy also stop drownings? And how about the people who have been stuck in Indonesian refugee camps indefinitely because they can’t afford to pay a people smuggler to bring them to Australia? Aren’t these people disadvantaged by their extreme poverty? If Australia agrees to provide a certain number of Humanitarian Visas each year, and the quota is filled by those asylum seekers who have survived the boat trip to Australia, what happens to the people who can’t afford to come by boat? I don’t think we talk about these forgotten people enough. One part of Rudd’s PNG policy announcement which seems to have flown under the radar, in preference for outrage and condemnation from some politicians, their supporters and those speaking on their behalf in the media, is the promise to “consider progressively increasing our humanitarian intake towards 27,000 as recommended by the Houston panel.” I congratulate Rudd on this, and I hope that it is not just considered, but also implemented. As I said, I fully support Australia accepting more refugees. Full stop. I guess where I’m feeling most confused is trying to reconcile my feelings about the policy, with the underlying dread that Rudd is just doing this to win votes. But then, isn’t beating Abbott, and stopping him turning back boats, a justifiable motive for doing whatever it takes to win the election? And is the PNG solution really as evil as many people are making out? I haven’t decided, but I appreciate the opportunity to think aloud, to analyse the situation before a knee-jerk reaction becomes my opinion. This is quite a foreign feeling for someone as opinionated as I am, but I’m learning to live with it. Exactly! Hopefully it will become common knowledge that hopping on a boat to Australia not only puts you at risk of drowning it will only lead to a life in PNG ……….and the dreadful people smuggling trade will quickly become a thing of the past. I am so tired of the politicisation of this issue and the intransigence of the main players. I am determined to be optimistic. On the up side I will no longer have to hear the repulsive ,hypocritical Morrison stridently baying that the LNP can “stop the boats” ! I am seeing a lot of comment about how bad the living conditions in PNG are and that sending them there is cruel, a punishment and totally unsafe. Those objections also apply to Indonesia where we want refugees to stay for years! Yes it IS a political fix but is it worse than the Abbott/Morrison solution will be? Whatever it turns out to be! Hi Victoria. Once again a great article exploring the tangential thoughts around this announcement. I echo your sentiments in that we don’t see enough in the media about refugees in displaced camps around the world patiently waiting and going through proper application and processing channels to move to be a better country. I hear it from my friend who works for Acts for Peace instead. I actually think it’s a brave and gutsy move. I hope it pays off. I think it could. What do the people smugglers have to sell now? Citizenship of PNG? And maybe, as argued, the majority of boat people are genuine refugees – and many of the ones that get to Australia are people of some means: money (albeit mostly all gone), education, skills and qualifications – perhaps it will be the making of a new Papua New Guinea. On the flipside I have had friends and family who have been to PNG and their experiences have been extraordinarily diverse. It is a primitive and hostile country in many ways – perhaps the potent disincentive needed at this juncture. Sadly, like the brouhaha of Australian politics, many Australian have become inured to the plight of boat people. We are powerless to change anything. We tune out. And so it goes. I think what has actually made the difference this week, was the recognition that we have to stop the boat people – not just for the sake of people risking their lives and drowning – but for the emotional well being of the Australians constantly embroiled in the catastrophes on the front line. The victims now have a face we can identify with and the common enemy is not the boat people but the boat people smugglers. Your thoughts here echo almost verbatim the dilemma I feel about Rudd’s decision. In fact we had a similar conversation here this morning. Difficult..
Those of us who vote with a conscience share your uncertainty. It’s easy, given we’re looking through the prism of an imminent election, to forget Labor has poor form regarding asylum seekers. It was Bob Hawke who closed the door on 220 Cambodian asylum seekers in 1989; it was Paul Keating who built a detention centre on Christmas Island and we know Prime Minister Gillard’s form in this area (and to his credit, at least PM Rudd tried to dismantle PM Howard’s regime). But, really, I blame Kim Beazley for capitulating to Howard’s agenda in the run up to the 2001 “Tampa” election. The end result was Labor losing the election anyway and this was when the Labor left started to splinter away to the Greens and the blue collar vote became Howard’s battlers. It’s one thing to lose an election, but it’s another thing to lose an election – and your identify – all is one fell swoop. The 2007 Labor victory was shallow. It was people voting against Howard overstaying his welcome. Rudd’s presidential style papered over the cracks in Labor’s structure – the collapse of 2010 and beyond was always going to happen because Labor squandered its opportunity to reform during its opposition years. Instead, it spent its time dancing to Howard’s play list. The solution? If you’re going to lose, at least lose with your principles intact. If you don’t, then you’ll find yourself in the same turgid mess Labor’s been in over this issue since 2001. PNG? Beautiful people, beautiful culture, beautiful country. I’ve spent a lot of time up there and love it. It’s a democracy in its early development. Many of the people seeking asylum are trades people (other more academically trained immigrants can fly in on professional visa’s) and PNG needs these sorts of people to upskill their own. There is a huge increase in the health, education and infrastructure AID that goes with this arrangement and that can only be good for PNG who is our nearest neighbour. These new settlers probably had not even heard of, nor thought of, or considered PNG as an option. Hello. Another loop hole closed. Just as long as this new solution works, it is better than those criminal people smugglers for profit are stopped from their disgusting trade. Having had a lot of experience on the high seas. It is always a horrible experience when a boat or ship sinks and people start drowning. Then I am in-favour of Rudd’s new solution. I have been on two boats that have sank and lucky for us fisherman we survived those ordeals out in Bass Straight. Over the years I have lost some friends who had drowned at sea and it brings back bad memories. The other is when towing any vessel there are always dangers, especially when top heavy or moveable cargo that is not lashed down correctly. In this case we must refer to those refugee passengers, who can sink a boat very easy by rushing to one side, thus capsizing the vessel, which has just happen with at least one of the latest fishing boat or similar small craft transporting its human cargo. 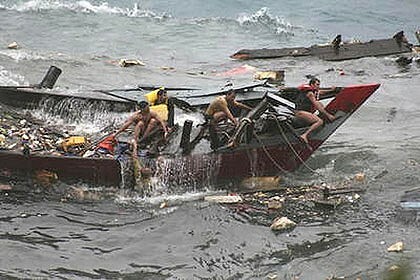 I know that I have written many times that Abbott Stop the Boats and even Howard’s Pacific Solution would have been over turned in the High Court of Australia when towing the boats back to Indonesia as it would breach the United Nations Convention for Refugees, if that country is a signature to such an agreement. If not, then there is no case to answer in the World Courts on Human Rights and that could be the next link in the chain for stopping the boats by disengaging such a signature by Rudd. I would prefer those seeking refugee status in Australia, would go through the right method and not cure jump the status, even if they have to wait in a refugee camp like everyone else who cannot afford the trip or pay People Smugglers. When the Vietnamese refugee exodus started from the collapse of South Vietnam during the mid 1970’s, when the DVA North Vietnam won the war against the South. Bidong Island refugee camp was set up after being swamped by Boat People (as they were called) by the Malaysian and UNHCR, which served its purpose well. Although some of those Vietnamese refugees did make it all the way to Australia and caused the same uproar as we are having now, things did settle it down by the Frazer Government by increasing our immigration responsibility. Yes! It makes me sick to the stomach too, when all those political parties jump up and down by their three word slogans Stop the Boat crap or it is breaching their human rights as refugees and we will contest in a court of law challenges costing the Australian Tax Payers heaps will and never change anything as the boats will keep on coming and people will continue to drown. Lets face it, this migration of people is not new as the Bible has recorded such actions by calling them the Sea People who came and settled. In some cases they even took over the countryside in the Golden Triangle of old. The only way to stop is to improve the well being of all nations and get rid of those dictator despots including the likes of Vladimir Putin as he is no saint either. Ah such as life said Ned. First I must correct the acronym DVA and should have used DRV Democratic Republic of Vietnam. For those who wish to apply as a Refugee must gain approval from the UNHCR for refugee static. Then those people can apply for the application 842 for the Offshore Humanitarian Visa for resettlement in Australia. It costs them nothing for this at all. If they are accepted then the Australian Government pays for their travel, medical expenses and lodgings for the trip Downunder. Like there is the right way and the wrong way to escape persecution for whatever the reason may be. Does your blog have a contact page? I’m having problems locating it but, I’d likje to send yyou an email.